I imagine everyone is outdoors, harvesting their mangelwurzels (Beta vulgaris subsp. maritima) today like me. A friend is thinking about brewing mangelwurzel beer, they’re supposed to make a potent drop. Alcohol is not my strong point. Would a beetroot or turnip recipe work as a substitute? Can anyone point me to a recipe? Mangelwurzel is a rustic, old-fashioned, cool temperate climate root crop derived from the fodder beet group of beetroot. It’s basically a large, sweet, golden beetroot with leaves that can be eaten like spinach. In my subtropical garden I sow them in autumn and grow them through spring. They store pretty well in the ground up to around Christmas when the hot, humid weather gradually weakens them – if you don’t harvest them in early summer they can rot. I’ve learned to only use a veneer of chopped sugarcane mulch – enough to keep the soil from heating up too much – applied too thickly, mulch conserves too much moisture and they can rot. Especially during prolonged warm, damp weather. Provide excellent drainage and water them well on alternate days. Get drainage, watering and mulching right and they will stay happy until the end of December. I’ve not succeeded in keeping mangelwurzel in the ground beyond the end of December, and they deteriorate when boxed and stored under the house at ambient temperatures. The roots do store well in the crisper of a fridge if the thin skin is unbroken. Trim off wispy roots and all leaves, brush off any loose soil, wrap them in a tea towel, then place this inside a plastic bag and store them in the crisper. This method has allowed me to keep them in perfect condition for three months, so it’s almost possible to have mangelwurzel all year round. 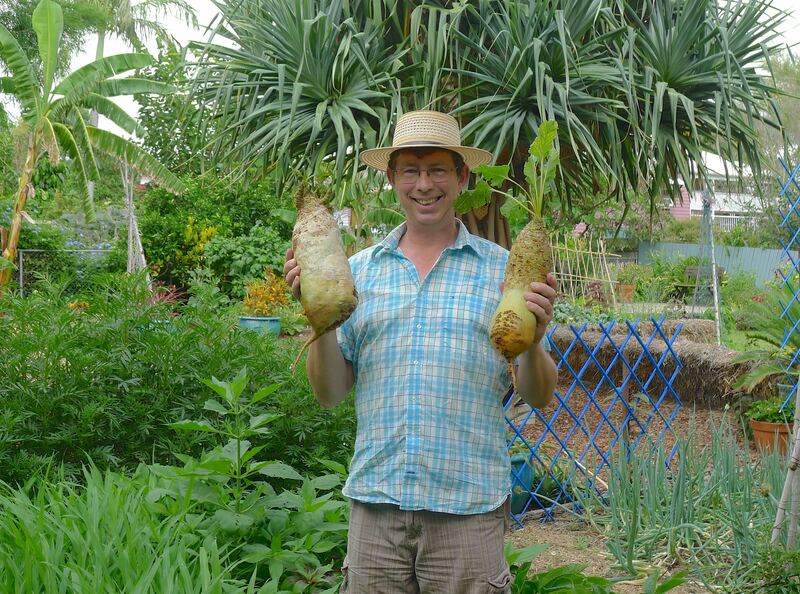 Here’s a story I recorded with Gardening Australia about growing mangelwurzel. Wash, trim roots, dice then boil for one hour, then strain. When tepid, sprinkle on yeast. Pictured: my latest crop. The root on the LHS weighs 2.85kg and the RHS 1.7kg. You could almost use them as exercise weights! Hmm. Tried growing these after you first mentioned them. Tried two years in a row without anything I could call success lol. No wine for me! They’re not hard to grow – they are the same species as silverbeet and beetroot. Mangelwurzel ‘seed’ is an aggregate seed, so there are 3-5 individual seeds in each, so you must be doing something wrong – either you’re using dead or old seed or seed that has been incorrectly stored, or you’re burying them.